Disguised as a frenetic adventure, the plot serves up the same old message about family values. 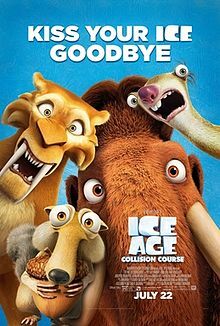 It’s strictly serviceable stuff that might engage the kids but will likely leave older fans bored and eager to bid the franchise a final farewell.I’m going with two out of five for Ice Age: Collision Course. It was nice knowing you folks, but your time is up. The bright spots are few and far between, and ideally — if you’re a parent looking to distract a child for a while — you ought to aim higher than this festival of poop-jokes and repetitive slapstick. Adults, who watch and approve of this film, should be judged without reservation, of course.Skate away from the rink, I’d say. This franchise is on thin ice. when the action shifts back to Sid, Buck and Scrat, you’d find yourself perking up again. And there are plenty of the antics of the latter three to enjoy here. There are quite a few sidekick characters – deBuck Weasel (Tyson), two loony opossums, Granny (Sykes), Shangri Llama (Jesse Tyler Ferguson) to name a few – who also liven things up, adding to the entertainment factor for kids. Oh, and do stay back for the post-credits scene. Collision Course is a relentless, fun-filled, fast-paced and most recent part in a long-running series that is pretty much sure to keep the kids (the audience for this movie) entertained with its energy. Non-stop chatter, Bollywood-style non sequiturs, smart-alecky Mumbai street lingo, manic pace and energy and often difficult-to-digest decibel levels mark the Hindi dubbed version of the 3D animated adventure flick Ice Age: Collision Course. More noise than nous, this is an animated movie that skates on rather thin ice in plot terms, with the freshness of the prehistoric beasts and their existential crises having worn off almost totally.Ice Age: Collision Course might be mildly entertaining for children looking for inoffensive diversion, but it definitely isn’t as chilled out as a couple of its predecessors, especially the one that the franchise kicked off with way back in 2002. Coming to the animation and visuals of the film, ICE AGE: COLLISION COURSE has certainly come a long way since the beginning of the series in 2002. Though the film features slick, fast paced visuals that catch your eye, the makers have managed to add incredible detail to the proceedings. Since the on screen happenings are fast paced with a few breathers (read slow moments), kids will definitely be hooked. On the whole, ICE AGE: COLLISION COURSE is not one of the big ticket, story-heavy Hollywood animation films we have seen in recent times. It is a light entertainer mainly targeting younger audiences but is worth a watch. Scrat’s epic pursuit of the elusive acorn catapults him into the universe where he accidentally sets off a series of cosmic events that transform and threaten the Ice Age World. To save themselves, Sid, Manny, Diego, and the rest of the herd must leave their home and embark on a quest full of comedy and adventure, travelling to exotic new lands and encountering a host of colorful new characters.